Most experienced parents understand that a changing table is an extremely important item, especially for newborn babies. Depending on your specific requirements, you may choose a changing table that doubles up as a dresser, a mobile unit an over cot changing table or even a vertical changing table. Why use vertical changing tables? Vertical changing tables are extremely convenient in regards to space as they are usually fixed against the wall and simply fold down whenever you need it. There are also other beneficial features to vertical changing tables such as the security offered in many of the high-end examples coupled with the robustness and durability of the overall unit. If it is mobility you are looking for then a vertical changing table certainly isn't the right choice as these will be securely fixed to the wall in either your baby's nursery or maybe even in the bathroom. In the UK today, there are in fact numerous manufacturers that offer high quality vertical changing tables at cost efficient prices. One particularly popular manufacturer is Dolphin Washrooms as their vertical changing table models are extremely high quality and also very durable. When choosing the right vertical changing table, ensure that the product meets or even exceeds British standards. The materials must also be extremely easy to clean and double check to make sure that the plastic helps prevent growth of unwanted bacteria. Other features of these types of changing tables? These types of changing tables are actually suitable for both babies and adults with many of them being able to admirably support weight of up to 27 stone. 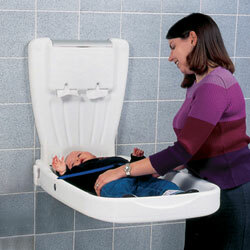 With a vertical changing table you should also ensure that the safety buckles are easy to use and many manufacturers offer consumers a buckle that is able to be adjusted with just one hand; this is especially important when considering an unsettled baby. Other beneficial aspects of a vertical wall changing table includes such things as conveniently placed hooks on either side of the base of the product. This is extremely helpful when you have bags to carry and no where to put them; simply hook them onto the sides of the unit and free your hands for the task at hand. If you are not experienced with DIY then you may want to hire the services of a professional or somebody that has experience in this matter. A vertical changing table will need fixing to the wall following the step-by-step instructions to ensure that the table has been constructed safely and securely. These types of changing tables are also highly suited towards those with disabilities and make the task of changing nappies a lot less stressful than with perhaps a more simple design. If you are looking for something that is convenience and easy to use that also takes up minimum space then a vertical baby changing table is definitely something you should consider. Prices in the UK range greatly yet with around150 pounds or more you can be rest assured that your purchase will be of high quality and last for as long as you need it to.